Big Sky Basketball: Does the Big Sky Have An Attendance Problem? It is the watch and follow part these days that is troublesome. Yes you could say the in the Big Sky the Sky is falling. Last year the average home attendance for all Big Sky men's games was 2,288. 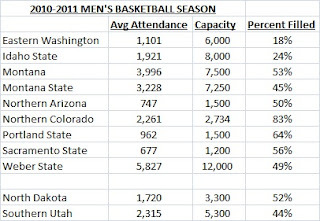 That figure stands out even more, when you consider out the 355 D-1 teams, Big Sky member Weber State ranked 93rd in attendance with average attendance of just under 6,000. Not bad. All of this begs the question - Is this a problem for the Big Sky or merely a fact of life in a mid-major conference? And speaking of scheduling, one thing that really damages the Big Sky attendance is the ability to attract quality teams to play in pre-season games. Of the three teams that have their schedules out for 2011-12, here is a sample of the schools that Big Sky teams will play in pre-season at home. South Dakota, Cal State Davis, Pacific Lutheran, Colorado Christian, Cal State Bakersfield, Mayville State, Northern New Mexico, Willamette and Linfield (twice). As you can see all big time basketball powerhouses. To call the quality of opponents that Big Sky teams are getting at home uninspiring would be an insult to the word "uninspiring." Nobody except extreme diehards are going to come out watch a game between a team in the Big Sky and Colorado Christian (a team that is based in Lakewood, CO, where I work, and I wasn't even aware they had an athletic program). These types of games are not going to attract a casual fan. I wonder if it would be possible for the Big Sky to explore matchups with other conferences, something similar to what the ACC and Big Ten do? I would think conferences like the Summit Conference or the Big West would be open to such an idea, since it would help them too. Getting a home game every other year (and going on the road the other year) against teams like Valparaiso, or Long Beach St., or another member of a similar conference would be a better draw then a D3 school, and would help the conference's RPI also. To take the other side of the coin, attendance might be a bigger problem than the conference ranking would suggest. For one, attendance was down by an average of 113 per game last season. Even though you might presume the economy would have something to do with that (and it might), about half of the conference saw their attendance averages go UP last season. The Big Sky was 19th among conferences a year ago. 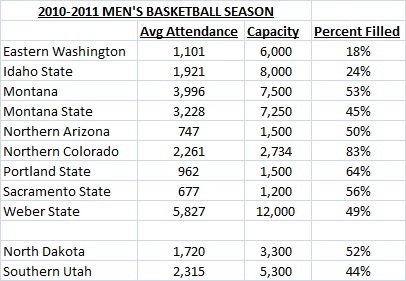 Another factor is Weber State, which was 93rd in the NCAA in average attendance last year, easily best in the conference. Their success might be skewing the average of the conference though, as they are the exception rather than the rule. If you take their attendance numbers out, the rest of the Big Sky averages 1,870 fans for their home games, a total that would put them 25th among conferences. In the end, I think the answer lies somewhere in the middle. To a certain extent the low attendance is a fact of life for a conference like the Big Sky, but it seems like more marketing and creativity could be done to lure in fans. The Big Sky puts out a quality basketball product, with lots of competition and intrigue. If they can harvest that, I don't see why the Big Sky couldn't be a top 15 conference in terms of average attendance. What does everyone else think? Are the attendance numbers a product of being a mid-major conference, or could more be done to help boost attendance numbers? Idaho State has actually upgraded their home non-conference schedule under Joe O'Brien. A couple of years ago, we played Washington State, BYU and Utah all at home. This year despite the horrid game against Colorado C. the Bengals play Loyola Marymount, Utah State, and North Dakota at home. Unfortunately, none of this has really improved attendance. I think it is the ESPN effect, everybody wants major basketball and not good mid-major bb, too bad. I attend NAU, and work on the TV crew that televises the games. I knew attendance was low in the Big Sky, but I thought NAU had one of the better attendance records--turns out they have the worst. As a student it makes perfect sense though. I didn't even know NAU had a basketball team until I started working for the TV crew my junior year. I just flat out didn't care and NAU didn't really do anything to make me care. I believe attendance often correlates with school spirit. How involved the students are within school activities. The problem is most of the schools in the Big Sky are commuter schools. I also believe talent and competition bring in school spirit. Why would I want to watch a bunch of scrubs play for my school against another team full of scrubs, when I could attend a Big Ten rivalry game filled with a stock of talented players and electric buzz it generates?